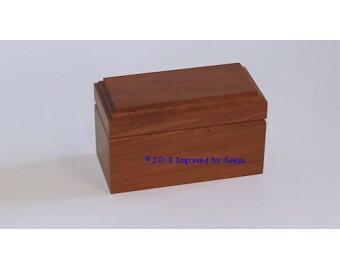 This cute little felt-lined Made-in-the-USA Keepsake Box is available in both Cherry wood and Dark Walnut wood. It's compact size makes it a treasure box to be loved for years to come. It can be used to store small cherished items or the perfect engagement ring. This box can be used for corporate and club awards. A 1.5" x 3" space is available across the whole lid of the box for engraving a name, or a name & dates, or text of your choice. Very Limited Quantity Remaining. Ths size box is longer made. 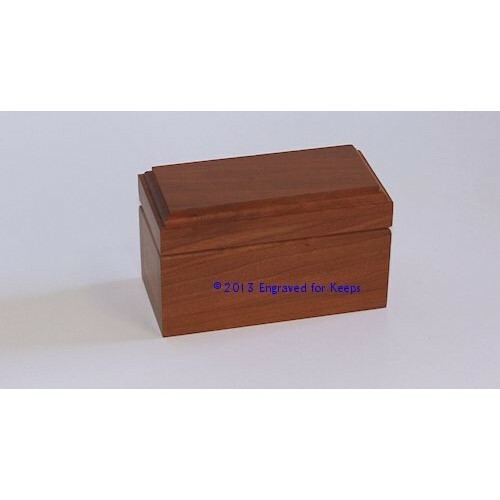 Dimensions 2" x 4" x 2.25" Outside Edges with Inside Edges approximately 1.25" x 3.25" x 1.15"
Engraving Options Includes personalized engraving with any amount of text that can fit in the 1.5" x 3" allotted space and your choice of standard font.